Happy September!! One of our favorite months of the year is here and we are beyond excited. 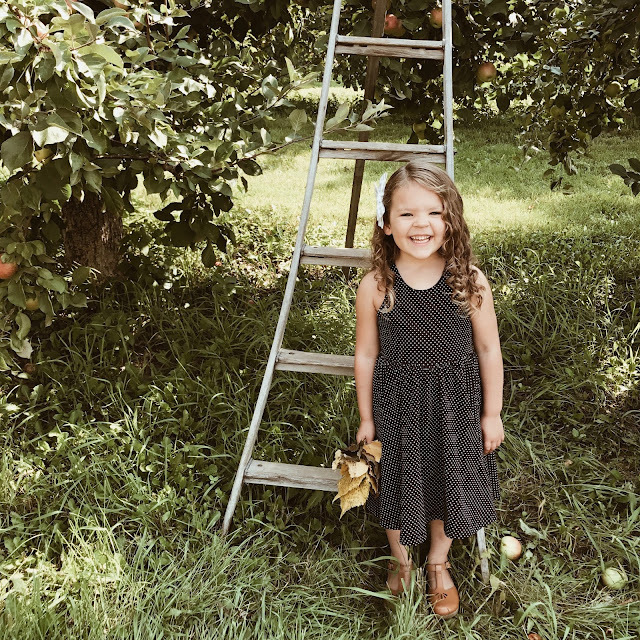 We kicked off the month by celebrating our 5th anniversary on September 1st, spent the weekend at the state fair and apple orchard, and then I took Olivia on a special lunch date because she starts school next week. We ended our long weekend with chicken chili and a pajama walk around the neighborhood, came home to all the windows open and a cool Fall breeze rolling in. And of course finishing off the apple turnovers we picked up at the orchard yesterday morning. If you've been following along for awhile you have probably seen the series I launched on my blog and instagram in the beginning of August called #TheMomBlogCollective, where each week I team up with a handful of my favorite mamas and we answer the questions we most often get related to blogging, instagram, motherhood & more. Today is the third post in our series and it's all about photos and editing. We'll be sharing our favorite tips and tricks for editing photos, our go-to apps and even how we get our kids to cooperate in front of the camera (read: bribery). You can find my first post here and the second post here. So 99% of my photos on my blog & instagram are shot with my iPhone 7 plus. I have a DSLR but rarely reach for it, especially when my arms are already full with three kids. From time to time I do use my DSLR, but I am still learning how to shoot manually and how to edit the way I like. So to keep it super simple, I make sure my iphone is always near me when I am hoping for -- or trying to capture -- a special moment. The second key is the editing. My favorite app for editing on my phone is VSCO, but I also like Afterlight. I almost always brighten my photos, add warmth and tweak the contrast and saturation. Below is an example of a photo I took yesterday at the apple orchard of Adaline which showcases the original photo (1) and how I edited it to create the final photo (4). It was about 11am, I had lots of natural light and I positioned her underneath a tree where she would mostly be in the shade but some sunlight would be peeking through, one of my favorite things to capture in my photos when I am shooting top down. 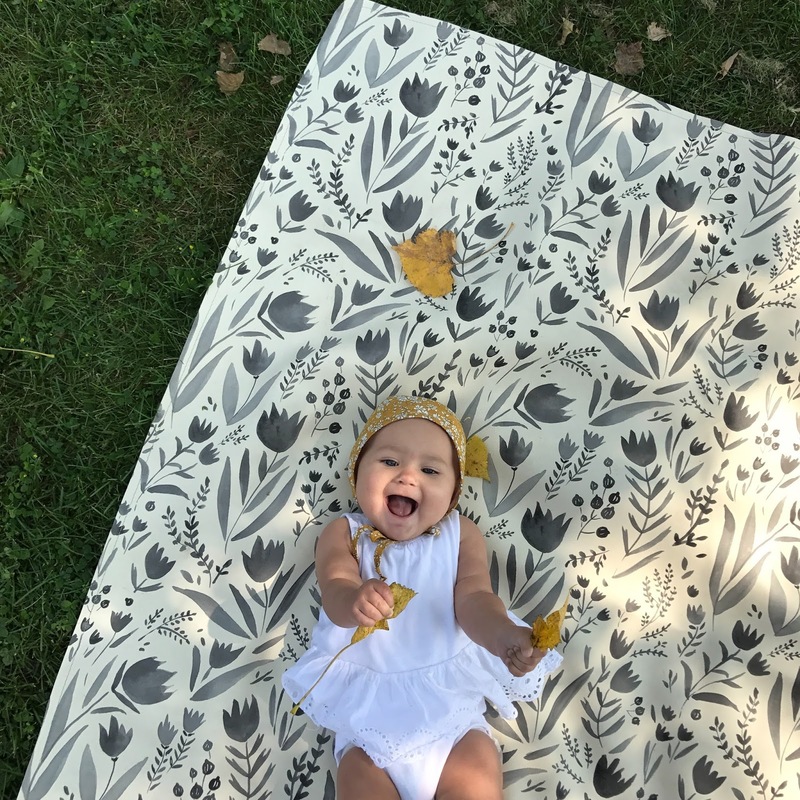 She is the happiest baby so getting her to smile was pretty easy (in between her trying to eat the leaves...) but when my girls aren't cooperating, I have a handful of go-to phrases and jokes that always make them laugh. Sometimes Dustin or I will tickle them or I'll just pretend I'm going to lunge at them to tickle them and that gets them smiling and laughing authentically and then I snap snap snap. 1. I start with the original photo. 2. I put a filter on it using VSCO -- I vary my filter depending on my subject and the overall feel I am going for. This is A4, which creates a very vintage look. 3. Next I added warmth and a tiny bit of brightness; this is very subtle but something your eye may be able to pick up on. 4. Finally, I modified contrast and saturation to create a brighter color and more vibrant feel, which is most noticeable in her bonnet and the yellow leaves around her. Everything I have learned about photography, editing and capturing the simple everyday moments and turning them in to beautiful photographs is truly self-taught. I am not an expert by any means, and I really just learn as I go. Find an app you love, practice with different filters, play around with editing and over time you will find your style and what really pleases your eye. Of course, as Moms we often envision the "perfect" photograph of our children and rarely do they just sit all in a row and cooperate. If only it were that easy!! 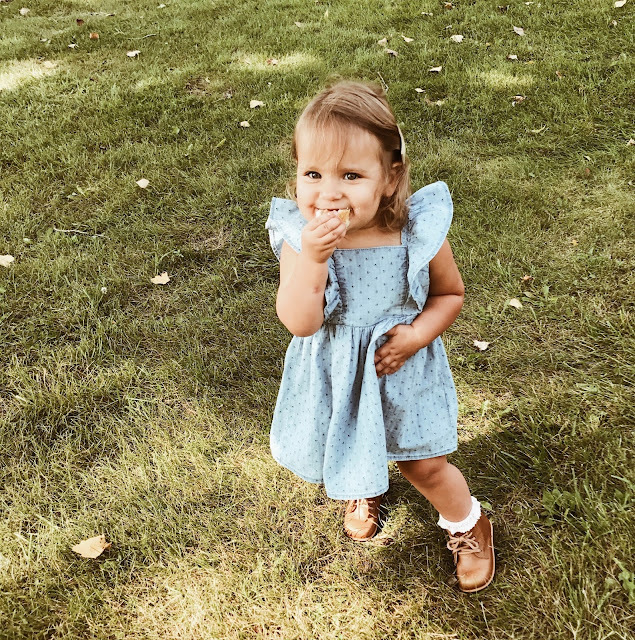 Olivia is almost 4.5 and is by far the easiest to photograph, because she basically stands, models for me and loves it. Poppy turns 2 this upcoming weekend and hardly ever stops moving, so she is the most challenging to photograph. Adaline is in the middle -- sometimes she will lay there still, but most of the time she wants to explore & discover everything around her, especially since she began crawling right before she turned 6 months old. I hope this gives you some insight in to how I capture and edit my photos and as always, if you have specific questions feel free to ask! You can also check out all the other posts today sharing about the same topic for lots of different tips and perspectives! Hope your week is off to a wonderful start! !